The Galaxy Railways is a 26 episode science fiction anime series about flying trains set in the far reaches of space. 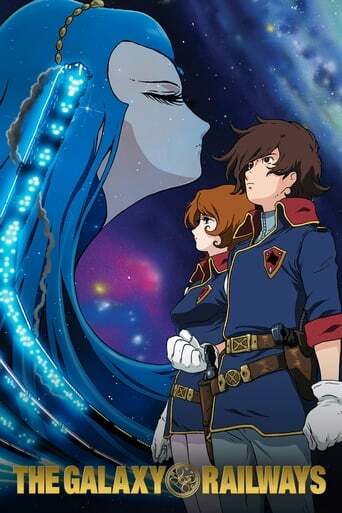 It is licensed by Funimation Production Ltd. and produced by Leiji Matsumoto. It debuted on American TV in a syndicated FUNimation Channel programming block airing on CoLours TV on Monday, June 19, 2006, but was replaced by Dragon Ball until the programming block was dropped. The series has also aired on the linear FUNimation Channel. Two sequels have been produced, both currently unlicensed in English regions. A 4-part OVA series The Galaxy Railways: A Letter from the Abandoned Planet was produced that bridges both seasons of the show. In 2006 a sequel series, The Galaxy Railways: Crossroads to Eternity began broadcasting in Japan for a 26-episode run. Of those 26, only 24 episodes were broadcast on television, with the final two released only on DVD. It has also been announced that on the 25-03-2009, an off take of the series called The Galaxy Railways: Faraway Angels will be released as a Drama CD. The story follows the Mizar platoon and their adventures.